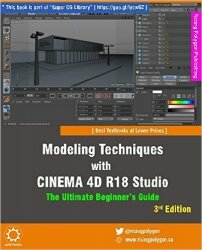 The Modeling Techniques with CINEMA 4D R18 Studio - The Ultimate Beginner’s Guide textbook offers a hands-on exercises based strategy for all those digital artists who have just started working on the CINEMA 4D [no experience needed] and interested in learning modeling in CINEMA 4D. This brilliant guide takes you step-by-step through the whole process of modeling. From the very first pages, the users of the book will learn how to effectively use CINEMA 4D for hard-surface modeling. A bonus chapter has been included in this edition containing six additional hands-on exercises.